Journal of the House of Lords: Volume 21, 1718-1721. Originally published by His Majesty's Stationery Office, London, 1767-1830. Epus. Bristol. Ds. Parker, Cancellarius. Dux Kent, Custos Privati Sigilli. Viscount Cobham. Ds. Willoughby Er. Pembroke's Pet. referred to Judges. It is Ordered, by the Lords Spiritual and Temporal in Parliament assembled, That the Consideration of the said Petition be, and is hereby, referred to Mr. Justice Dormer and Mr. Justice Eyre; who are forthwith to summon all Parties concerned in the Bill; and, after hearing them, to report to the House the State of the Case, with their Opinion thereupon, under their Hands; and whether all Parties that may be concerned in the Consequences of the Bill have signed the Petition; and also that the Judges, having perused the Bill, do sign the same. And the House being informed, "That Mr. Justice Blencowe is gone into the Country, for Recovery of his Health:"
It is Ordered, That the Consideration of the said Petition be, and is hereby, referred to Mr. Justice Fortescue, in the room of the said Mr. Justice Blencowe. Commissioners of forfeited Estates versus Mackenzies. 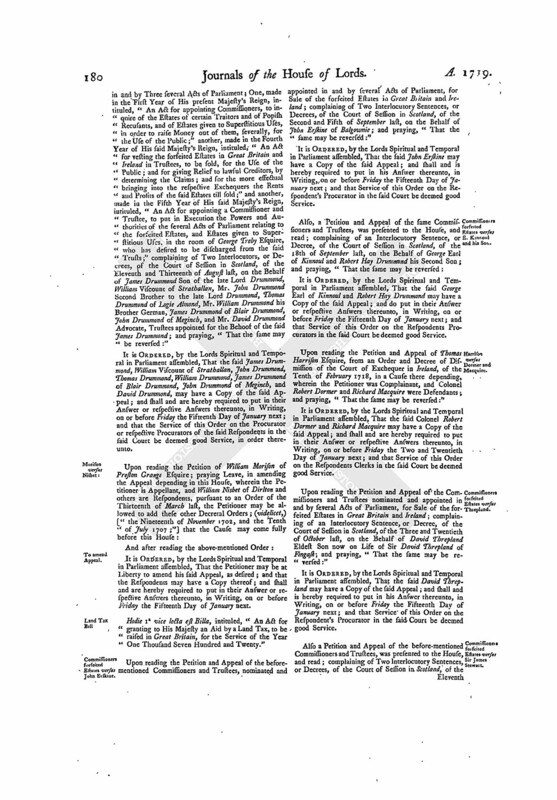 It is Ordered, by the Lords Spiritual and Temporal in Parliament assembled, That the said Kenneth Mackenzie and Colonel Alexander Mackenzie may have a Copy of the said Appeal; and shall and are hereby required to put in their Answer or respective Answers thereunto, in Writing, on or before Tuesday the Twelsth Day of January next; and that Service of this Order on the respective Procurators of the Respondents in the said Court be deemed good Service, in order thereunto. Commissioners of forfeited Estates versus Erskine. Also, a Petition and Appeal of the same Commissioners and Trustees was presented to the House, and read; complaining of an Interlocutor, or Decree, of the Court of Session in Scotland, of the Eighteenth of September last, on the Behalf of Thomas Erskine Son to John late Earl of Mar and others; and praying, "That the same may be reversed:"
It is Ordered, by the Lords Spiritual and Temporal in Parliament assembled, That the said Thomas Erskine may have a Copy of the said Appeal; and shall and is hereby required to put in his Answer thereunto, in Writing, on or before Tuesday the Twelfth Day of January next; and that Service of this Order on the Respondent's Procurator in the said Court be deemed good Service, in order thereunto. And the House being this Day moved, on the Behalf of the said Respondents, "That a Day may be appointed, for hearing thereof:"
It is Ordered, That this House will hear the said Cause, by Counsel, at the Bar, on Wednesday the Thirteenth Day of January next, at Eleven a Clock. Butler to enter into a Recognizance for Butler. Upon reading the Petition of Theobald Butler, Appellant in a Cause depending in this House, to which Sir Thomas Prendergast Baronet, an Infant, and others, are Respondents; praying, "That the Recognizance of Theobald Butler of London Merchant may be taken for the Petitioner, he residing in Ireland:"
It is Ordered, That the said Theobald Butler may enter into Recognizance for the said Appellant, according to the Prayer of the said Petition. Dunch and Godfrey, Leave for a Bill. Hodie 1a vice lecta est Billa, intituled, "An Act for supplying the Defects in, and better Performance of, the Will of Edmond Dunch Esquire, deceased." Ordered, That the Committee appointed to inspect the Manner of keeping Records and Public Papers in Offices be revived; and meet, from Time to Time, when, where, and as often as, they please. Ordered, by the Lords Spiritual and Temporal in Parliament assembled, That the House be called over on Tuesday the Twelfth Day of January next. Dominus Cancellarius declaravit præsens Parliamentum continuandum esse usque ad et in diem Veneris, decimum octavum diem instantis Decembris, hora undecima Aurora, Dominis sic decernentibus. Viscount Castleton. Ds. Willoughby Er. Whereas there is an Appeal depending in this House, wherein Mathew Lant Esquire is Appellant, and Alice Crispe and William Crispe are Respondents; and though the Cause was appointed to be heard the last Session of Parliament, yet the same came not to a Hearing: And the House being this Day moved, on the Behalf of the said Appellant, "To appoint a Day for hearing thereof:"
It is Ordered, That this House will hear the said Cause, by Counsel, at the Bar, on Friday the Fifteenth Day of January next, at Eleven a Clock. Commissioners forfeited Estates versus Maxwell. Upon reading the Petition and Appeal of Richard Grantham Esquire, Arthur Ingram Esquire, George Gregory Esquire, Sir Richard Steele Knight, Sir Henry Hoghton Baronet, Patrick Haldane Esquire, Sir Thomas Hales Baronet, Robert Munro Esquire, Henry Cuningham Esquire, Dennis Bond Esquire, John Birch Serjeant at Law, Sir John Eyles Baronet, and Charles Long Esquire, Commissioners and Trustces nominated and appointed in and by Three several Acts of Parliament; One, made in the First Year of His present Majesty's Reign, intituled, "An Act for appointing Commissioners, to inquire of the Estates of certain Traitors and of Popish Recusants, and of Estates given to Superstitious Uses, in order to raise Money out of them, severally, for the Use of the Public;" another, made in the Fourth Year of His said Majesty's Reign, intituled, "An Act for vesting the forfeited Estates in Great Britain and Ireland in Trustees, to be sold, for the Use of the Public; and for giving Relief to lawful Creditors, by determining the Claims; and for the more effectual bringing into the respective Exchequers the Rents and Profits of the said Estates till sold;" and another, made in the Fifth Year of His said Majesty's Reign, intituled, "An Act for appointing a Commissioner and Trustee, to put in Execution the Powers and Authorities of the several Acts of Parliament relating to the forfeited Estates, and Estates given to Superstitious Uses, in the room of George Treby Esquire, who has desired to be discharged from the said Trusts;" complaining of Two Interlocutors, or Decrees, of the Court of Session in Scotland, of the One and Twentieth of August and Seventeenth of September last, on the Behalf of Wm. Maxwell Son to William late Earl of Nithsdale; and praying, "That the same may be reversed:"
It is Ordered, by the Lords Spiritual and Temporal in Parliament assembled, That the said William Maxwell may have a Copy of the said Appeal; and shall and is hereby required to put in his Answer thereunto, in Writing, on or before Friday the Fifteenth Day of January next; and that Service of this Order on the Respondent's Procurator in the said Court be deemed good Service, in order thereunto. With a Bill, intituled, "An Act for granting to His Majesty an Aid by a Land Tax, to be raised in Great Britain, for the Service of the Year One Thousand Seven Hundred and Twenty;" to which they desire the Concurrence of this House. Annesley versus Sherlock; Account of Proceedings in Ireland. The Lord Chancellor acquainted the House, "That he had received an Account, from the Barons of His Majesty's Court of Exchequer in Ireland, of what they had done in Obedience to the Orders of this House, of the Three and Twentieth of January last, made on the Behalf of Maurice Annesley Esquire, and directing them to proceed, by the most speedy and effectual Methods, to cause Possession of the Estate of the said Maurice Annesley Esquire, as required by Order of this House of the Sixth of February last, to be restored to him, of which he was dispossessed pending his Appeal; and also for causing the Respondent Hester Sherlock to accompt before them, upon Oath, for the Rents and Profits of the Estate in Question, which she has made or received, since her gaining the Possession thereof by the Orders of the House of Lords in Ireland, and to answer and pay the same to the said Appellant Maurice Annesley; which said Orders were, in Pursuance of Two other Orders of the same Day for that Purpose, transmitted by his Lordship to the said Barons of the Court of Exchequer in Ireland." "To the Right Honourable the Lords Spiritual and Temporal of Great Britain in Parliament assembled. "We, the Barons of His Majesty's Court of Exchequer in Ireland, do humbly beg Leave to lay before your Lordships the underwritten Order, which we have made in Obedience to your Lordships said Orders. Wednesday, the 4th of February, 1718. "To the Lord Chief Baron of the Exchequer in Ireland, and the rest of the Barons of that Court." "Die Veneris, 23o Die Januarii, 1718. Ordered, by the Lords Spiritual and Temporal in Parliament assembled, That the Lord High Chancellor of Great Britain do transmit the Two Orders made this Day, on the Behalf of Maurice Annesley Esquire, to the Barons of the Court of Exchequer in Ireland; commanding them, at the same Time, to return, as soon as they can, an Account of what shall be done therein. "Upon Report from the Lords Committees appointed to inquire into the Reason of the Delay in not obeying the Orders of this House, relating to the Appeal of Maurice Annesley Esquire, and how the same may more properly be enforced: It is Ordered, by the Lords Spiritual and Temporal in Parliament assembled, That the Barons of the Court of Exchequer in Ireland be, and are hereby, directed to proceed, by the most speedy and effectual Methods, to cause Possession of the Estate of the said Maurice Annesley, as required by the Order of this House of the Sixth of February last, to be restored to him. "Were, by the Order of this Honourable Court, publicly read in open Court. Whereupon, and upon reading the said Letter and Orders, it is this Day, in Obedience thereunto, Ordered, by the Right Honourable the Chancellor, Treasurer, Lord Chief Baron, and the rest of the Barons of His Majesty's Court of Exchequer in Ireland, That the Injunction of this Court do forthwith issue, directed to the said Hester Sherlock and to the several and respective Tenants of the Lands in Question, requiring them, and every of them, quietly to restore to the said Maurice Annesley the Possession of the Town and Lands of Little Rath, Bodinstown, Darr, and Mullenaffooky, lying and being in the County of Kildare, being the Lands comprehended in the said Order: And it is also Ordered, That the said Injunction and this Order be served, by the Pursuivant attending this Court, or by any other Person whom the said Maurice Annesley or his Agent shall name, upon the said Hester Sherlock, and the several and respective Tenants of the Lands aforesaid; and the said Maurice Annesley, or his Agent, is hereby required to leave the Names of the several and respective Tenants of the said Lands at the proper Office, in order to be inserted in the said Injunction: And it is further Ordered, That the Rents of the said Lands, remaining in the several Tenants Hands, from the Time the said Hester Sherlock was put into Possession, be by them forthwith paid over to the said Maurice Annesley; and that a Copy of this Order be served upon the respective Tenants of the said Lands, together with the said Injunction. "Die Veneris, 23o Januarii, 1718. 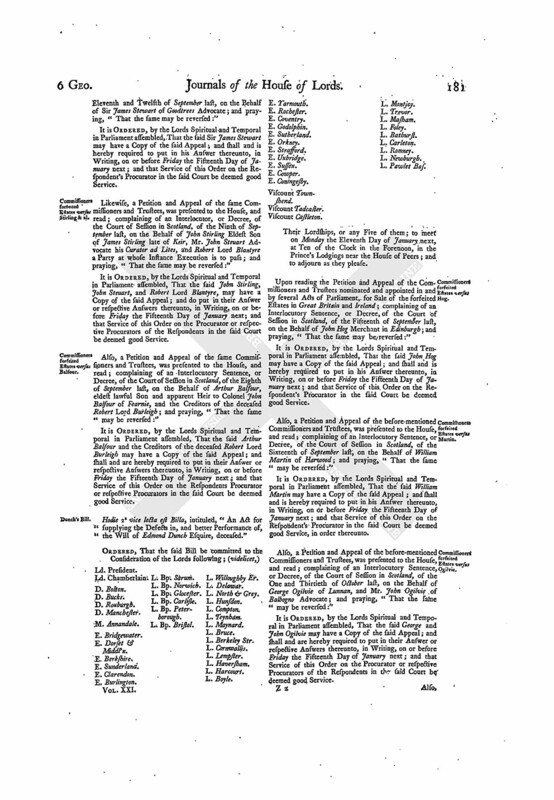 "Ordered, by the Lords Spiritual and Temporal in Parliament assembled, That the Barons of the Court of Exchequer in Ireland do cause the Respondent Hester Sherlock to accompt before them, upon Oath, for the Rents and Profits of the Estate in Question, which she has received or made, since her gaining the Possession thereof by the Orders of the House of Lords in Ireland; and to answer and pay the same to the Appellant Maurice Annesley Esquire; but without Prejudice to the Right, in case of an Appeal to be brought by either Party from the Decree of the Exchequer in Ireland. "Whereupon, and upon reading the said last mentioned Order, it is this Day, in Obedience thereunto, further Ordered, by the Right Honourable the Chancellor, Treasurer, Lord Chief Baron, and the rest of the Barons of His Majesty's Court of Exchequer in Ireland, That a Writ of Execution of the said Order do forthwith issue, to enforce the said Order, directed to the said Hester Sherlock, and to be served upon her by the said Pursuivant, or by such Person as the said Maurice Annesley or his Agent shall name; and that if due Obedience be not paid thereunto, that all other subsequent Process of this Court do issue against the said Hester Sherlock, that have been usual, to enforce Obedience to the Decrees of this Court. "All which we most humbly certify, this present 10th Day of February, 1718. "To the Right Honourable the Lords Spiritual and Temporal of Great Britain, in Parliament assembled. 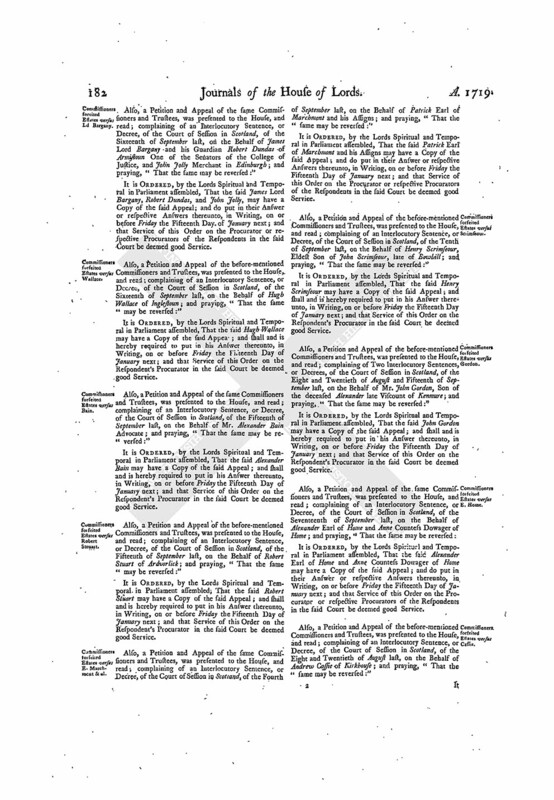 "Whereas, by Order of this Court, dated the Fourth of February Instant, made in Pursuance of an Order of the House of Lords in Great Britain, it was, amongst other Things, therein mentioned, ordered, That the Injunction of this Court should forthwith issue, directed to the Defendant Hester Sherlock, and to the several and respective Tenants to the Lands in Question, requiring them, and every of them, quietly to restore to the Plaintiff Maurice Annesley the Possession of the Town and Lands of Little Rath, Bodinstown, Darr, and Mullenafooky, lying and being in the County of Kildare; pursuant to which Order, the Injunction of this Honourable Court accordingly issued, under the Seal of this Honourable Court: Now Mr. Beauman, Attorney for the said Maurice Annesley, this Day produced to the Court an Affidavit made by Richard Lyons; whereby it appear ed, "That Dennis Galvin, Tenant to Part of the said Lands of Little Rath, was, on the 21st of this Instant February, duly served with the said Injunction; and notwithstanding the Possession of that Part of the said Lands which he the said Galvin holds was then demanded from him in Pursuance of the said Injunction, yet he absolutely refused to deliver up the same." The said Mr. Beauman therefore prayed an Attachment against him the said Galvin, for his Contempt aforesaid. Whereupon, and upon reading the said Affidavit of the Truth of the said Matter, it is Ordered by the Court, That an Attachment, directed to the Pursuivant attending this Honourable Court, be, and is hereby, awarded against the said Dennis Galvin, for his Contempt aforesaid, as is desired. "And we further beg Leave to lay before your Lordships, that, upon Inquiry, we are informed, that the said Dennis Galvin and all the other Tenants delivered up the Possession of the said Lands; and that the said Hester Sherlock absconds, so that she cannot be served with the Process of this Court. "All which we humbly certify to your Lordships, this 14th of April, 1719. Address for Representation, &c. of House of Lords in Ireland, concerning the Proceedings in this Cause. Ordered, by the Lords Spiritual and Temporal in Parliament assembled, That an humble Address be presented to His Majesty, humbly to desire, "His Majesty will be graciously pleased to cause the Representation from the House of Lords in Ireland to His Majesty, and Extracts out of the Journals of that House, of all their Proceedings with relation to the Cause of Annesley versus Sherlock, or any other Cause upon Appeal to the House of Lords in Ireland, during the last Session of Parliament there, and concerning the Lord Chief Baron and the rest of the Barons of His Majesty's Court of Exchequer in Ireland, to be laid before this House." The Earl Stanhope (by His Majesty's Command) presented to the House a Petition of Charles Duke of Queensberry and Dover, with His Majesty's Reference thereupon. "That Her late Majesty Queen Ann, by Letters Patent under the Great Seal of Great Britain, dated the 26th of May in the Seventh Year of Her Reign, was pleased to grant to Your Petitioner's Father, James then Duke of Queensberry, the Honour, Style, Title, and Dignity, of Baron of Rippon and Marquis of Beverly, in the County of York, and Duke of Dover in the County of Kent, to him during his Life, and after his Death to your Petitioner and his Heirs Male. "In Pursuance whereof, a Writ of Summons was issued to summon the said Duke to Parliament; who accordingly was, the 19th of November 1708, introduced into the House of Lords, and took his Seat there, and continued to sit and vote in Two several Parliaments; no Objection being at any Time made to such his Right, during his Life. "That your Petitioner is lately come of Age; and, by virtue of the Limitations in the said Patent, having a Right to sit and vote in Parliament, did apply to the Lord Chancellor for a Writ of Summons for that Purpose; but the same has not yet been issued. "Your Petitioner humbly prays, Your Majesty will be graciously pleased to cause a Writ of Summons to be issued to Your Petitioner, for his coming to sit and vote in Parliament, according to his said Right. "We are graciously pleased to reser this Petition to the House of Peers, to take the Petitiouer's Claim and Title into their Consideration, and to do and determine thereupon what shall be found just and right. "Given at Our Court at St. James's, the Sixteenth Day of December 1719, in the Sixth Year of Our Reign. D. Dover to be heard by Counsel. Upon reading the Petition of Charles Duke of Queensberry and Dover, presented to His Majesty, and by His Majesty referred to this House; praying, "That His Majesty will be graciously pleased to cause a Writ of Summons to be issued to the Petitioner, for his coming to sit and vote in Parliament:"
It is Ordered, by the Lords Spiritual and Temporal in Parliament assembled, That this House will take the Matter of the said Petition and Reference into Consideration on Tuesday the Twelfth Day of January next; and that the Petitioner may be then heard, by his Counsel, if he thinks fit. L. Chancellor to write to absent Lords. It is also Ordered, by the Lords Spiritual and Temporal in Parliament assembled, That the Lord Chancellor do write Letters to the absent Lords, to acquaint them of the Call of the House on Tuesday the Twelfth of January next; and that the Consideration of the Duke of Dover's Petition is appointed for that Day; and that the House doth expect and require their Attendance. Commissioners forfeited Estates versus Ja. Drummond & al. 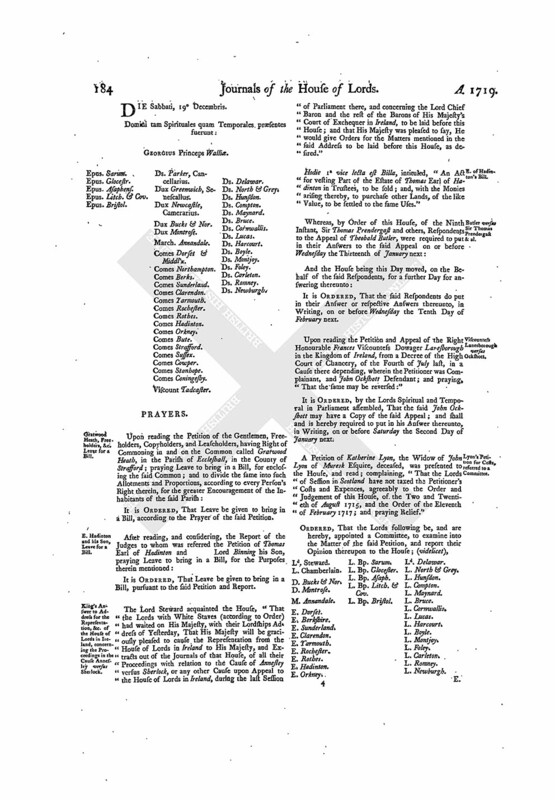 Upon reading the Petition and Appeal of Rich'd Grantham Esquire, Arthur Ingram Esquire, George Gregory Esquire, Sir Richard Stcele Knight, Sir Henry Hoghton Baronet, Patrick Haldane Esquire, Sir Thomas Hales Baronet, Robert Munro Esquire, Henry Cunningham Esquire, Dennis Bond Esquire, John Birch Serjeant at Law, Sir John Eyles Baronet, and Charles Long Esquire, Commissioners and Trustees nominated and appointed in and by Three several Acts of Parliament; One, made in the First Year of His present Majesty's Reign, intituled, "An Act for appointing Commissioners, to inquire of the Estates of certain Traitors and of Popish Recusants, and of Estates given to Superstitious Uses, in order to raise Money out of them, severally, for the Use of the Public;" another, made in the Fourth Year of His said Majesty's Reign, intituled, "An Act for vesting the forfeited Estates in Great Britain and Ireland in Trustees, to be sold, for the Use of the Public; and for giving Relief to lawsul Creditors, by determining the Claims; and for the more effectual bringing into the respective Exchequers the Rents and Prosits of the said Estates till sold;" and another, made in the Fifth Year of His said Majesty's Reign, intituled, "An Act for appointing a Commissioner and Trustee, to put in Execution the Powers and Authorities of the several Acts of Parliament relating to the forfeited Estates, and Estates given to Superstitious Uses, in the room of George Treby Esquire, who has desired to be discharged from the said Trusts;" complaining of Two Interlocutors, or Decrees, of the Court of Session in Scotland, of the Eleventh and Thirteenth of August last, on the Behalf of James Drummond Son of the late Lord Drummond, William Viscount of Strathallan, Mr. John Drummond Second Brother to the late Lord Drummond, Thomas Drummond of Logie Almond, Mr. William Drummond his Brother German, James Drummond of Blair Drummond, John Drummond of Meginch, and Mr. David Drummond Advocate, Trustees appointed for the Behoof of the said James Drummond; and praying, "That the same may be reversed:"
It is Ordered, by the Lords Spiritual and Temporal in Parliament assembled, That the said James Drummond, William Viscount of Strathallan, John Drummond, Thomas Drummond, William Drummond, James Drummond of Blair Drummond, John Drummond of Meginch, and David Drummond, may have a Copy of the said Appeal; and shall and are hereby required to put in their Answer or respective Answers thereunto, in Writing, on or before Friday the Fifteenth Day of January next; and that the Service of this Order on the Procurator or respective Procurators of the said Respondents in the said Court be deemed good Service, in order thereunto. It is Ordered, by the Lords Spiritual and Temporal in Parliament assembled, That the Petitioner may be at Liberty to amend his said Appeal, as desired; and that the Respondents may have a Copy thereof; and shall and are hereby required to put in their Answer or respective Answers thereunto, in Writing, on or before Friday the Fifteenth Day of January next. Hodie 1a vice lecta est Billa, intituled, "An Act for granting to His Majesty an Aid by a Land Tax, to be raised in Great Britain, for the Service of the Year One Thousand Seven Hundred and Twenty." Commissioners forfeited Estates versus John Erskine. Upon reading the Petition and Appeal of the beforementioned Commissioners and Trustees, nominated and appointed in and by several Acts of Parliament, for Sale of the forfeited Estates in Great Britain and Ireland; complaining of Two Interlocutory Sentences, or Decrees, of the Court of Session in Scotland, of the Second and Fifth of September last, on the Behalf of John Erskine of Balgownie; and praying, "That the same may be reversed:"
It is Ordered, by the Lords Spiritual and Temporal in Parliament assembled, That the said John Erskine may have a Copy of the said Appeal; and shall and is hereby required to put in his Answer thereunto, in Writing, on or before Friday the Fifteenth Day of January next; and that Service of this Order on the Respondent's Procurator in the said Court be deemed good Service. Commissioners forfeited Estates versus E. Kinnoul and his Son. It is Ordered, by the Lords Spiritual and Temporal in Parliament assembled, That the said George Earl of Kinnoul and Robert Hay Drummond may have a Copy of the said Appeal; and do put in their Answer or respective Answers thereunto, in Writing, on or before Friday the Fifteenth Day of January next; and that Service of this Order on the Respondents Procurators in the said Court be deemed good Service. Harrison versus Dormer and Macquire. Upon reading the Petition and Appeal of Thomas Harrison Esquire, from an Order and Decree of Dismission of the Court of Exchequer in Ireland, of the Tenth of February 1718, in a Cause there depending, wherein the Petitioner was Complainant, and Colonel Robert Dormer and Richard Macquire were Defendants; and praying, "That the same may be reversed:"
It is Ordered, by the Lords Spiritual and Temporal in Parliament assembled, That the said Colonel Robert Dormer and Richard Macquire may have a Copy of the said Appeal; and shall and are hereby required to put in their Answer or respective Answers thereunto, in Writing, on or before Friday the Two and Twentieth Day of January next; and that Service of this Order on the Respondents Clerks in the said Court be deemed good Service. Commissioners for feited Estates versus Threpland. 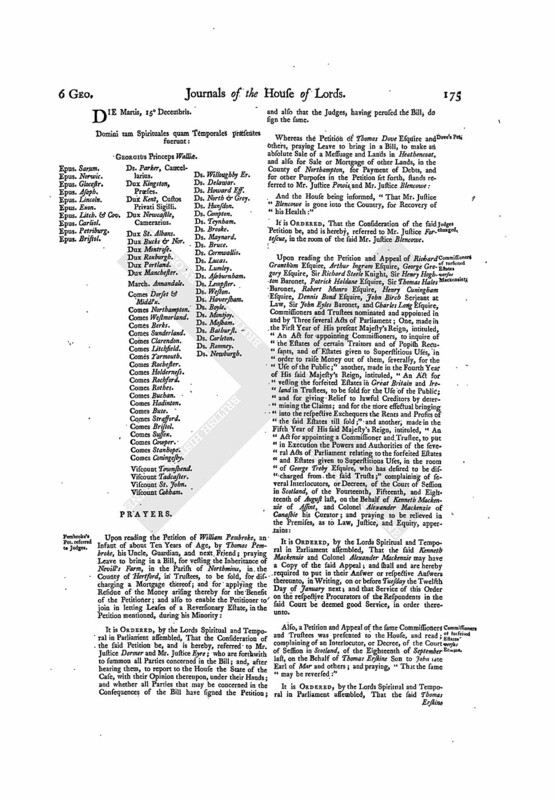 Upon reading the Petition and Appeal of the Commissioners and Trustees nominated and appointed in and by several Acts of Parliament, for Sale of the forfeited Estates in Great Britain and Ireland; complaining of an Interlocutory Sentence, or Decree, of the Court of Session in Scotland, of the Three and Twentieth of October last, on the Behalf of David Threpland Eldest Son now on Life of Sir David Threpland of Fingask; and praying, "That the same may be reversed:"
It is Ordered, by the Lords Spiritual and Temporal in Parliament assembled, That the said David Threpland may have a Copy of the said Appeal; and shall and is hereby required to put in his Answer thereunto, in Writing, on or before Friday the Fifteenth Day of January next; and that Service of this Order on the Respondent's Procurator in the said Court be deemed good Service. Commissioners forfeited Estates versus Sir James Stewait. Also a Petition and Appeal of the before-mentioned Commissioners and Trustees, was presented to the House, and read; complaining of Two Interlocutory Sentences, or Decrees, of the Court of Session in Scotland, of the Eleventh and Twelfth of September last, on the Behalf of Sir James Stewart of Goodtrees Advocate; and praying, "That the same may be reversed:"
It is Ordered, by the Lords Spiritual and Temporal in Parliament assembled, That the said Sir James Stewart may have a Copy of the said Appeal; and shall and is hereby required to put in his Answer thereunto, in Writing, on or before Friday the Fifteenth Day of January next; and that Service of this Order on the Respondent's Procurator in the said Court be deemed good Service. Commissioners forteited Estates versus Stirling & al. Likewise, a Petition and Appeal of the same Commissioners and Trustees, was presented to the House, and read; complaining of an Interlocutor, or Decree, of the Court of Session in Scotland, of the Ninth of September last, on the Behalf of John Stirling Eldest Son of James Stirling late of Keir, Mr. John Steuart Advocate his Curator ad Lites, and Robert Lord Blantyre a Party at whose Instance Execution is to pass; and praying, "That the same may be reversed:"
It is Ordered, by the Lords Spiritual and Temporal in Parliament assembled, That the said John Stirling, John Steuart, and Robert Lord Blantyre, may have a Copy of the said Appeal; and do put in their Answer or respective Answers thereunto, in Writing, on or before Friday the Fifteenth Day of January next; and that Service of this Order on the Procurator or respective Procurators of the Respondents in the said Court be deemed good Service. Commissioners forseited Estates versus Balfour. Also, a Petition and Appeal of the same Commissioners and Trustees, was presented to the House, and read; complaining of an Interlocutory Sentence, or Decree, of the Court of Session in Scotland, of the Eighth of September last, on the Behalf of Arthur Balfour, eldest lawful Son and apparent Heir to Colonel John Balfour of Fearnie, and the Creditors of the deceased Robert Lord Burleigh; and praying, "That the same may be reversed:"
It is Ordered, by the Lords Spiritual and Temporal in Parliament assembled, That the said Arthur Balfour and the Creditors of the deceased Robert Lord Burleigh may have a Copy of the said Appeal; and shall and are hereby required to put in their Answer or respective Answers thereunto, in Writing, on or before Friday the Fifteenth Day of January next; and that Service of this Order on the Respondents Procurator or respective Procurators in the said Court be deemed good Service. Hodie 2a vice lecta est Billa, intituled, "An Act for supplying the Defects in, and better Performance of, the Will of Edmond Dunch Esquire, deceased." Viscount Castleton. L. Bp. Sarum. L. Bp. Bristol. L. Willoughby Er. Their Lordships, or any Five of them; to meet on Monday the Eleventh Day of January next, at Ten of the Clock in the Forenoon, in the Prince's Lodgings near the House of Peers; and to adjourn as they please. Commissioners forfeited Estates versus Hog. Upon reading the Petition and Appeal of the Commissioners and Trustees nominated and appointed in and by several Acts of Parliament, for Sale of the forfeited Estates in Great Britain and Ireland; complaining of an Interlocutory Sentence, or Decree, of the Court of Session in Scotland, of the Fifteenth of September last, on the Behalf of John Hog Merchant in Edinburgh; and praying, "That the same may be reversed:"
It is Ordered, by the Lords Spiritual and Temporal in Parliament assembled, That the said John Hog may have a Copy of the said Appeal; and shall and is hereby required to put in his Answer thereunto, in Writing, on or before Friday the Fifteenth Day of January next; and that Service of this Order on the Respondent's Procurator in the said Court be deemed good Service. Commissioners forfeited Estates versus Martin. Also, a Petition and Appeal of the before mentioned Commissioners and Trustees, was presented to the House, and read; complaining of an Interlocutory Sentence, or Decree, of the Court of Session in Scotland, of the Sixteenth of September last, on the Behalf of William Martin of Harwood; and praying, "That the same may be reversed:"
It is Ordered, by the Lords Spiritual and Temporal in Parliament assembled, That the said William Martin may have a Copy of the said Appeal; and shall and is hereby required to put in his Answer thereunto, in Writing, on or before Friday the Fifteenth Day of January next; and that Service of this Order on the Respondent's Procurator in the said Court be deemed good Service, in order thereunto. Commissioners forfeited Estates versus Ogilvie. Also, a Petition and Appeal of the before-mentioned Commissioners and Trustees, was presented to the House, and read; complaining of an Interlocutory Sentence, or Decree, of the Court of Session in Scotland, of the One and Thirtieth of October last, on the Behalf of George Ogilvie of Lunnan, and Mr. John Ogilvie of Balbogno Advocate; and praying, "That the same may be reversed:"
It is Ordered, by the Lords Spiritual and Temporal in Parliament assembled, That the said George and John Ogilvie may have a Copy of the said Appeal; and shall and are hereby required to put in their Answer or respective Answers thereunto, in Writing, on or before Friday the Fifteenth Day of January next; and that Service of this Order on the Procurator or respective Procurators of the Respondents in the said Court be deemed good Service. Commissioners foreited Estates versus Ld Bargany. 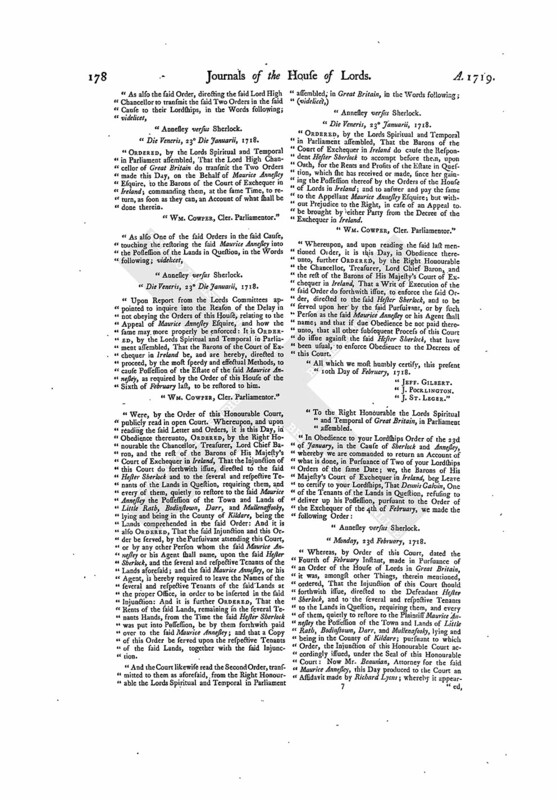 Also, a Petition and Appeal of the same Commissioners and Trustees, was presented to the House, and read; complaining of an Interlocutory Sentence, or Decree, of the Court of Session in Scotland, of the Sixteenth of September last, on the Behalf of James Lord Bargany and his Guardian Robert Dundas of Armistoun One of the Senators of the College of Justice, and John Jolly Merchant in Edinburgh; and praying, "That the same may be reversed:"
It is Ordered, by the Lords Spiritual and Temporal in Parliament assembled, That the said James Lord Bargany, Robert Dundas, and John Jolly, may have a Copy of the said Appeal; and do put in their Answer or respective Answers thereunto, in Writing, on or before Friday the Fifteenth Day of January next; and that Service of this Order on the Procurator or respective Procurators of the Respondents in the said Court be deemed good Service. Commissioners forfeited Estates versus Wallace. Also, a Petition and Appeal of the before-mentioned Commissioners and Trustees, was presented to the House, and read; complaining of an Interlocutory Sentence, or Decree, of the Court of Session in Scotland, of the Sixteenth of September last, on the Behalf of Hugh Wallace of Inglestoun; and praying, "That the same may be reversed:"
It is Ordered, by the Lords Spiritual and Temporal in Parliament assembled, That the said Hugh Wallace may have a Copy of the said Appea; and shall and is hereby required to put in his Answer thereunto, in Writing, on or before Friday the Fifteenth Day of January next; and that Service of this Order on the Respondent's Procurator in the said Court be deemed good Service. Commissioners forfeited Estates versus Bain. Also, a Petition and Appeal of the same Commissioners and Trustees, was presented to the House, and read; complaining of an Interlocutory Sentence, or Decree, of the Court of Session in Scotland, of the Fifteenth of September last, on the Behalf of Mr. Alexander Bain Advocate; and praying, "That the same may be reversed:"
It is Ordered, by the Lords Spiritual and Temporal in Parliament assembled, That the said Alexander Bain may have a Copy of the said Appeal; and shall and is hereby required to put in his Answer thereunto, in Writing, on or before Friday the Fifteenth Day of January next; and that Service of this Order on the Respondent's Procurator in the said Court be deemed good Service. Commissioners forfeited Estates versus Robert Steuart. Also, a Petition and Appeal of the before-mentioned Commissioners and Trustees, was presented to the House, and read; complaining of an Interlocutory Sentence, or Decree, of the Court of Session in Scotland, of the Fifteenth of September last, on the Behalf of Robert Stuart of Ardvorlick; and praying, "That the same may be reversed:"
It is Ordered, by the Lords Spiritual and Temporal in Parliament assembled, That the said Robert Stuart may have a Copy of the said Appeal; and shall and is hereby required to put in his Answer thereunto, in Writing, on or before Friday the Fifteenth Day of January next; and that Service of this Order on the Respondent's Procurator in the said Court be deemed good Service. Commissioners forfeited Estates versus E. Marchmont & al. Also, a Petition and Appeal of the same Commissioners and Trustees, was presented to the House, and read; complaining of an Interlocutory Sentence, or Decree, of the Court of Session in Scotland, of the Fourth of September last, on the Behalf of Patrick Earl of Marchmont and his Assigns; and praying, "That the same may be reversed:"
It is Ordered, by the Lords Spiritual and Temporal in Parliament assembled, That the said Patrick Earl of Marchmont and his Assigns may have a Copy of the said Appeal; and do put in their Answer or respective Answers thereunto, in Writing, on or before Friday the Fifteenth Day of January next; and that Service of this Order on the Procurator or respective Procurators of the Respondents in the said Court be deemed good Service. Commissioners forfeited Estates versus Scrimseour. 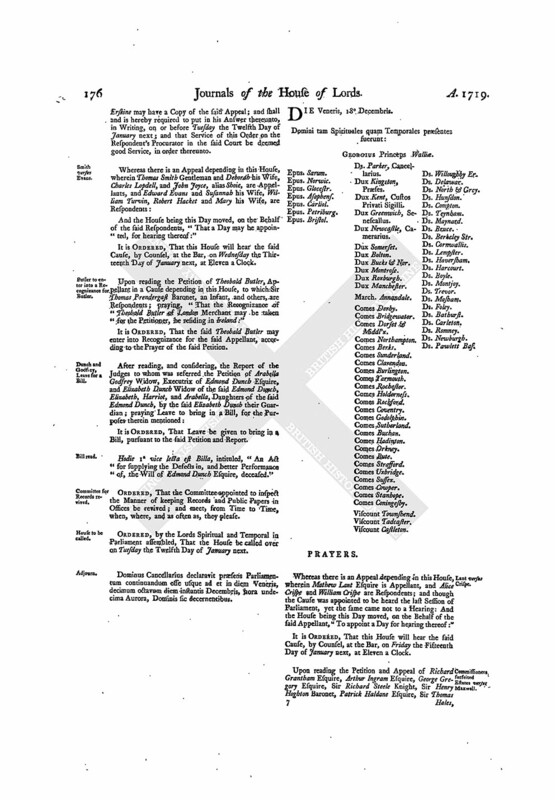 Also, a Petition and Appeal of the before-mentioned Commissioners and Trustees, was presented to the House, and read; complaining of an Interlocutory Sentence, or Decree, of the Court of Session in Scotland, of the Tenth of September last, on the Behalf of Henry Scrimseour, Eldest Son of John Scrimseour, late of Bowbill; and praying, "That the same may be reversed:"
It is Ordered, by the Lords Spiritual and Temporal in Parliament assembled, That the said Henry Scrimseour may have a Copy of the said Appeal; and shall and is hereby required to put in his Answer thereunto, in Writing, on or before Friday the Fifteenth Day of January next; and that Service of this Order on the Respondent's Procurator in the said Court be deemed good Service. Commissioners forfeited Estates versus Gordon. 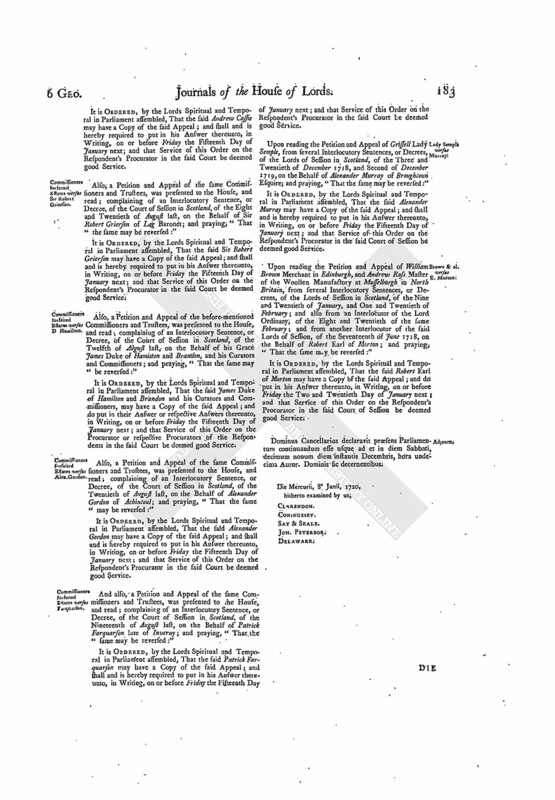 Also, a Petition and Appeal of the before-mentioned Commissioners and Trustees, was presented to the House, and read; complaining of Two Interlocutory Sentences, or Decrees, of the Court of Session in Scotland, of the Eight and Twentieth of August and Fifteenth of September last, on the Behalf of Mr. John Gordon, Son of the deceased Alexander late Viscount of Kenmure; and praying, "That the same may be reversed:"
It is Ordered, by the Lords Spiritual and Temporal in Parliament assembled, That the said John Gordon may have a Copy of the said Appeal; and shall and is hereby required to put in his Answer thereunto, in Writing, on or before Friday the Fifteenth Day of January next; and that Service of this Order on the Respondent's Procurator in the said Court be deemed good Service. Commissioners forfeited Estates versus E. Home. It is Ordered, by the Lords Spiritual and Temporal in Parliament assembled, That the said Alexander Earl of Home and Anne Countess Dowager of Home may have a Copy of the said Appeal; and do put in their Answer or respective Answers thereunto, in Writing, on or before Friday the Fifteenth Day of January next; and that Service of this Order on the Procurator or respective Procurators of the Respondents in the said Court be deemed good Service. Commissioners forfeited Estates versus Cassie. Also, a Petition and Appeal of the before-mentioned Commissioners and Trustees, was presented to the House, and read; complaining of an Interlocutory Sentence, or Decree, of the Court of Session in Scotland, of the Eight and Twentieth of August last, on the Behalf of Andrew Cassie of Kirkhouse; and praying, "That the same may be reversed:"
It is Ordered, by the Lords Spiritual and Temporal in Parliament assembled, That the said Andrew Cassie may have a Copy of the said Appeal; and shall and is hereby required to put in his Answer thereunto, in Writing, on or before Friday the Fifteenth Day of January next; and that Service of this Order on the Respondent's Procurator in the said Court be deemed good Service. Commissioners forfeited Estates versus Sir Robert Grierson. Also, a Petition and Appeal of the same Commissioners and Trustees, was presented to the House, and read; complaining of an Interlocutory Sentence, or Decree, of the Court of Session in Scotland, of the Eight and Twentieth of August last, on the Behalf of Sir Robert Grierson of Lag Baronet; and praying, "That the same may be reversed:"
It is Ordered, by the Lords Spiritual and Temporal in Parliament assembled, That the said Sir Robert Grierson may have a Copy of the said Appeal; and shall and is hereby required to put in his Answer thereunto, in Writing, on or before Friday the Fifteenth Day of January next; and that Service of this Order on the Respondent's Procurator in the said Court be deemed good Service. Commissioners forfeited Estates versus D Hamilton. Also, a Petition and Appeal of the before-mentioned Commissioners and Trustees, was presented to the House, and read; complaining of an Interlocutory Sentence, or Decree, of the Court of Session in Scotland, of the Twelfth of Aùgust last, on the Behalf of his Grace James Duke of Hamilton and Brandon, and his Curators and Commissioners; and praying, "That the same may be reversed:"
It is Ordered, by the Lords Spiritual and Temporal in Parliament assembled, That the said James Duke of Hamilton and Brandon and his Curators and Commissioners, may have a Copy of the said Appeal; and do put in their Answer or respective Answers thereunto, in Writing, on or before Friday the Fifteenth Day of January next; and that Service of this Order on the Procurator or respective Procurators of the Respondents in the said Court be deemed good Service. Commissioners forfeited Estates versus Alex Gordon. Also, a Petition and Appeal of the same Commissioners and Trustees, was presented to the House, and read; complaining of an Interlocutory Sentence, or Decree, of the Court of Session in Scotland, of the Twentieth of August last, on the Behalf of Alexander Gordon of Achintoul; and praying, "That the same may be reversed:"
It is Ordered, by the Lords Spiritual and Temporal in Parliament assembled, That the said Alexander Gordon may have a Copy of the said Appeal; and shall and is hereby required to put in his Answer thereunto, in Writing, on or before Friday the Fifteenth Day of January next; and that Service of this Order on the Respondent's Procurator in the said Court be deemed good Service. Commissioners forfeited Estates versus Farquarson. And also, a Petition and Appeal of the same Commissioners and Trustees, was presented to the House, and read; complaining of an Interlocutory Sentence, or Decree, of the Court of Session in Scotland, of the Nineteenth of August last, on the Behalf of Patrick Farquarson late of Inveray; and praying, "That the same may be reversed:"
It is Ordered, by the Lords Spiritual and Temporal in Parliament assembled, That the said Patrick Farquarson may have a Copy of the said Appeal; and shall and is hereby required to put in his Answer thereunto, in Writing, on or before Friday the Fifteenth Day of January next; and that Service of this Order on the Respondent's Procurator in the said Court be deemed good Service. Upon reading the Petition and Appeal of Grissell Lady Semple, from several Interlocutory Sentences, or Decrees, of the Lords of Session in Scotland, of the Three and Twentieth of December 1718, and Second of December 1719, on the Behalf of Alexander Murray of Broughtoun Esquire; and praying, "That the same may be reversed:"
It is Ordered, by the Lords Spiritual and Temporal in Parliament assembled, That the said Alexander Murray may have a Copy of the said Appeal; and shall and is hereby required to put in his Answer thereunto, in Writing, on or before Friday the Fifteenth Day of January next; and that Service of this Order on the Respondent's Procurator in the said Court of Session be deemed good Service. Brown & al. versus E. Morton. 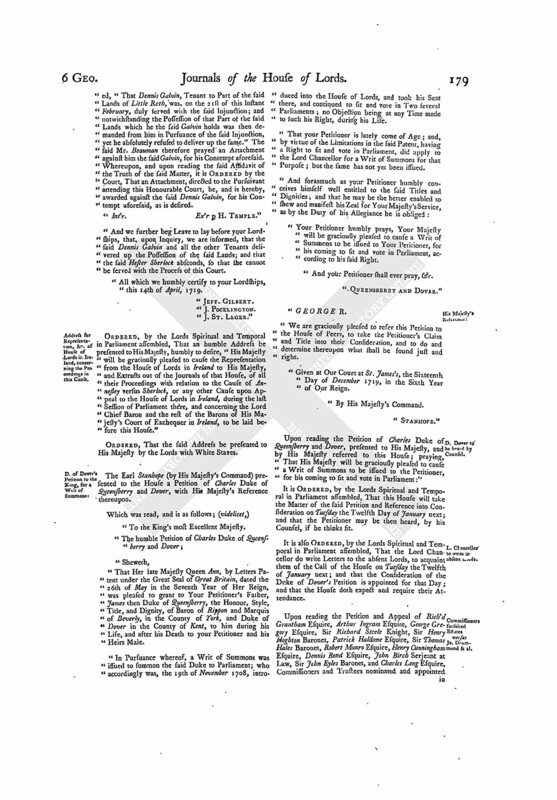 Upon reading the Petition and Appeal of William Brown Merchant in Edinburgh, and Andrew Ross Master of the Woollen Manufactory at Musselburgh in North Britain, from several Interlocutory Sentences, or Decrees, of the Lords of Session in Scotland, of the Nine and Twentieth of January, and One and Twentieth of February; and also from an Interlocutor of the Lord Ordinary, of the Eight and Twentieth of the same February; and from another Interlocutor of the said Lords of Session, of the Seventeenth of June 1718, on the Behalf of Robert Earl of Morton; and praying, "That the same may be reversed:"
It is Ordered, by the Lords Spiritual and Temporal in Parliament assembled, That the said Robert Earl of Morton may have a Copy of the said Appeal; and do put in his Answer thereunto, in Writing, on or before Friday the Two and Twentieth Day of January next; and that Service of this Order on the Respondent's Procurator in the said Court of Session be deemed good Service. Dominus Cancellarius declaravit præsens Parliamentum continuandum esse usque ad et in diem Sabbati, decimum nonum diem instantis Decembris, hora undecima Auror. Dominis sic decernentibus. Gratwood Heath, Freeholders, &c. Leave for a Bill. E. Hadinton and his Son, Leave for a Bill. King's Answer to Address for the Representation, &c. of the House of Lords in Ireland, concerning the Proceedings in the Cause Annesley versus Sherlock. The Lord Steward acquainted the House, "That the Lords with White Staves (according to Order) had waited on His Majesty, with their Lordships Address of Yesterday, That His Majesty will be graciously pleased to cause the Representation from the House of Lords in Ireland to His Majesty, and Extracts out of the Journals of that House, of all their Proceedings with relation to the Cause of Annesley versus Sherlock, or any other Cause upon Appeal to the House of Lords in Ireland, during the last Session of Parliament there, and concerning the Lord Chief Baron and the rest of the Barons of His Majesty's Court of Exchequer in Ireland, to be laid before this House; and that His Majesty was pleased to say, He would give Orders for the Matters mentioned in the said Address to be laid before this House, as desired." Hodie 1a vice lecta est Billa, intituled, "An Act for vesting Part of the Estate of Thomas Earl of Hadinton in Trustees, to be sold; and, with the Monies arising thereby, to purchase other Lands, of the like Value, to be settled to the same Uses." Butler versus Sir Thomas Prendergast & al. It is Ordered, That the said Respondents do put in their Answer or respective Answers thereunto, in Writing, on or before Wednesday the Tenth Day of February next. 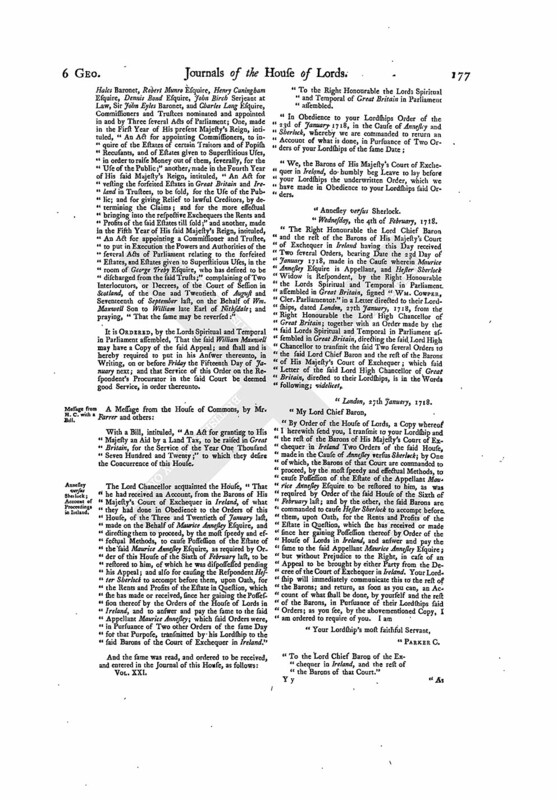 Upon reading the Petition and Appeal of the Right Honourable Frances Viscountess Dowager Lanesborough in the Kingdom of Ireland, from a Decree of the High Court of Chancery, of the Fourth of July last, in a Cause there depending, wherein the Petitioner was Complainant, and John Ockshott Defendant; and praying, "That the same may be reversed:"
It is Ordered, by the Lords Spiritual and Temporal in Parliament assembled, That the said John Ockshott may have a Copy of the said Appeal; and shall and is hereby required to put in his Answer thereunto, in Writing, on or before Saturday the Second Day of January next. Lyon's Petition for Costs, referred to a Committee. A Petition of Katherine Lyon, the Widow of John Lyon of Muresk Esquire, deceased, was presented to the House, and read; complaining, "That the Lords of Session in Scotland have not taxed the Petitioner's Costs and Expences, agreeably to the Order and Judgement of this House, of the Two and Twentieth of August 1715, and the Order of the Eleventh of February 1717; and praying Relief." V. Tadcaster. L. Bp. Sarum. L. Bp. Bristol. Ld. Delawar. Their Lordships, or any Five of them; to meet on Monday next, at Ten a Clock in the Forenoon, in the Prince's Lodgings near the House of Peers; and to adjourn as they please. Hodie 2a vice lecta est Billa, intituled, "An Act for granting to His Majesty an Aid by a Land Tax, to be raised in Great Britain, for the Service of the Year One Thousand Seven Hundred and Twenty." 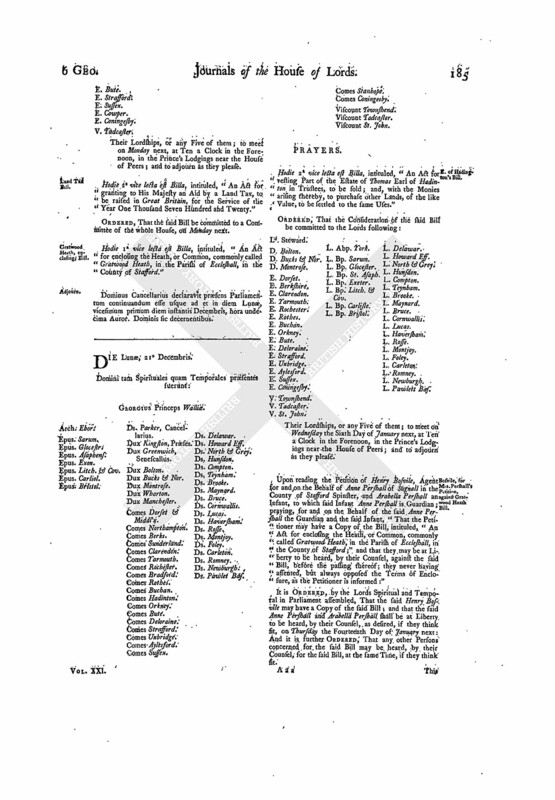 Hodie 1a vice lecta est Billa, intituled, "An Act for enclosing the Heath, or Common, commonly called Gratwood Heath, in the Parish of Eccleshall, in the County of Stafford." Dominus Cancellarius declaravit præsens Parliamentum continuandum esse usque ad et in diem Lunæ, vicesimum primum diem instantis Decembris, hora undecima Auror. Dominis sic decernentibus.